[x_section style="margin: 0px 0px 0px 0px; padding: 45px 0px 45px 0px; "][x_row inner_container="true" marginless_columns="false" bg_color="" style="margin: 0px auto 0px auto; padding: 0px 0px 0px 0px; "][x_column bg_color="" type="1/1" style="padding: 0px 0px 0px 0px; "][x_text class="left-text "]Have you noticed any of these warning signs? Please list any concerns you have and take this checklist with you to the doctor. in the early stages, is forgetting recently learned information. Others include forgetting important dates or events; asking for the same information over and over; relying on memory aides (e.g., reminder notes or electronic devices) or family members for things they used to handle on their own. What"s typical? Making occasional errors when balancing a checkbook. 3. Difficulty completing familiar tasks at home, at work or at leisure. People with Alzheimer"s often find it hard to complete daily tasks. Sometimes, people may have trouble driving to a familiar location, managing a budget at work or remembering the rules of a favorite game. What"s typical? Occasionally needing help programming electronics or recording a show. immediately. Sometimes they may forget where they are or how they got there. What"s typical? Getting confused about the day of the week but figuring it out later. 5. Trouble understanding visual images and spatial relationships. For some people, having vision problems is a sign of Alzheimer"s. They may have difficulty reading, judging distance and determining color or contrast. In terms of perception, they may pass a mirror and think someone else is in the room. They may not recognize their own reflection. What"s typical? Vision changes related to cataracts. 6. New problems with words in speaking or writing. People with Alzheimer"s may have trouble following or joining a conversation. They may stop in the middle of a conversation and have no idea how to continue or they may repeat themselves. They may struggle with vocabulary, have problems finding the right word or call things by the wrong name (e.g., calling a watch a "hand clock"). What"s typical? Sometimes having trouble finding the right word. 7. Misplacing things and losing the ability to retrace steps. A person with Alzheimer"s disease may put things in unusual places. They may lose things and be unable to go back over their steps to find them again. Sometimes, they may accuse others of stealing. This may occur more frequently over time. Whats typical? Misplacing things from time to time, such as a pair of glasses or the remote control. 8. Decreased or poor judgment. People with Alzheimer"s may experience changes in judgment or decision-making. For example, they may use poor judgment when dealing with money, giving large amounts to telemarketers. They may pay less attention to grooming or keeping themselves clean. Whats typical? Making a bad decision once in a while. 9. Withdrawal from work or social activities. A person with Alzheimer"s may start to remove themselves from hobbies, social activities, work projects or sports. They may have trouble keeping up with a favorite sports team or remembering how to complete a favorite hobby. They may also avoid being social because of the changes they’ve experienced. What's typical? Sometimes feeling weary of work, family and social obligations. 10. Changes in mood and personality. The mood and personalities of people with Alzheimer"s can change. They can become confused, suspicious, depressed, fearful or anxious. They may be easily upset at home, at work, with friends or in places where they are out of their comfort zone. What's typical? Having routines and becoming irritable when a routine is disrupted. If you have questions about any of these warning signs, the Alzheimer"s Association recommends consulting a physician. Early diagnosis provides the best opportunities for treatment, support and future planning. 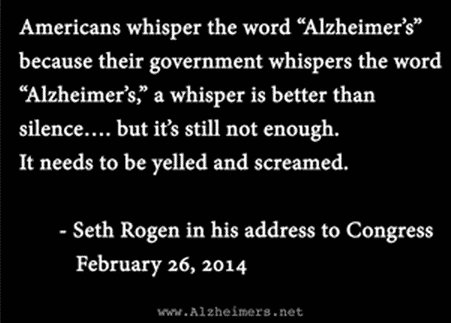 For more information, go to alz.org/10signs or call 800.272.3900. This is an official publication of the Alzheimer's Association but may be distributed by unaffiliated organizations or individuals. Such distribution does not constitute an endorsement of these parties or their activities by the Alzheimer"s Association. Copyright 2009 Alzheimer"s Association. All rights reserved.